Anne Blythe’s best friend Sarah is getting married. On top of that, Anne is coming off the most destructive of her generally unhealthy relationships—this one to a guy named Stuart. Reaching her mid-30s, Anne is desperate to find “Mr. Right” and decides to seek the very expensive services of a company that arranges marriages. Not your typical match.com dating service, mind you, but a company that actually arranges marriages—think medieval royalty or Russian marriage brokers. . . . The philosophy of the company is that marriages fail (or people with perpetually unsuccessful relationships fail to find a mate) because they are blinded by the concept of romantic love and under-prioritize the more lasting qualities in people and relationships that lead to healthy, long term sustainability. Catherine McKenzie successfully and frequently highlights this theme throughout the book. Her premise for an intriguing story is there; however, the writing is uneven and at times amateurish, crying out for editorial intervention. Likely the best scene in the book comes toward the end when Anne discovers Jack has a secret regarding the book he has written—yes, Jack is the man she ends up marrying. To go into too much detail here would constitute a spoiler, so consider it a tease for those who are intrigued by the premise of the book. On page 16, she looks up into a former flame’s “blue, blue eyes,” a phrase she actually has the audacity to repeat later in the novel. In the same chapter, the reader also gets “oh so blue eyes” and “powder blue eyes.” Her brother has “hazel” eyes and the man he sets her up with “dark brown eyes.” When she meets Jack for the first time, the reader learns that “his green eyes shade a tad darker” than hers. If there is something symbolic about eyes that causes the author to focus on them to such an extent, this reader missed the message. And there are too many times when the dialogue is not much better than these aforementioned descriptions. When, in a somewhat confused state toward the end of the novel, Anne finds herself contemplating her future with Jack, she either thinks to herself or answers multiple people’s questions in a four-page span with the words, “Yes, no, maybe.” Perhaps a cute trick, but minimally effective in terms of developing the plot or the main character. Readers of Spin, Ms. McKenzie’s first novel, released in America in February of 2012, will recognize some familiar themes and similar approaches to various situations. Anne and her future husband are aspiring writers, like to party, and for the most part, are trapped in a state of perpetual adolescence. Like in Spin, the plot in Arranged hangs on the deception of a person looking for their first big break. 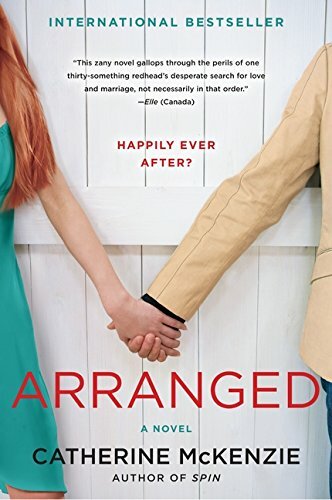 For some, Arranged could be classified as a pretty good read; others may find too many obstacles in the execution to really enjoy it.